We’re lucky enough to be working with a strength and conditioning coach by the name of Tom Kelso. Tom is formerly the Director of Sports Performance for Pinnacle Performance Training and has recently taken a position with the St. Louis Metropolitan Police Department as an Exercise Specialist and Programming Director. Tom is a very knowledgable guy and the audio interview we did with him was outstanding. Those clips will be available at Hybrid Fitness when we go live. In the meantime, register your name and email address on the site so we can keep you informed. Here’s a video of Tom in action, working with one of his clients. This particular type of training is called HIMAX Training. As Tom describes it, normal HIMAX sessions result in about 12 – 15 exercises/intervals per 1/2 hour session and around 20 exercises for an hour session. They factor in about 10 minutes of stretching as well, so the actual work duration is around 45-50 minutes. As Tom says, “most who come to us are looking to lose fat and look better, thus we try to push them to their limit to maximize energy expenditure”. Check out the video and feel free to post your comments. So I’m getting my fill of daily news articles and I come across this gem of an article from wnbc.com. The link appears below. 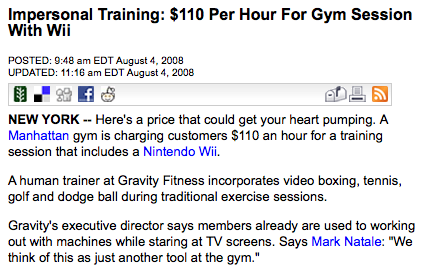 To summarize, a gym in Manhattan is charging $110 per hour for training on a Nintendo WiiFit. A trainer walks the client through a series of exercises ranging from boxing, tennis, dodgeball, etc. All I can say is, if you’ve got a bunch of disposable income and you’re looking for a place to blow it, move to Manhattan, seek out this gym and spend all the money you want, then see what you get after 6 months…or a year. My guess is, not much. Conversely, if you’re looking for top notch articles, programs, video and audio clips, nutrition information and some of the most useful fitness and training information you’ll find anywhere on the web, go to www.hybridfitness.tv, register your name & email address and we’ll let you know when the site goes live. Suffice it to say, you can train for ONE HOUR in Manhattan, or an ENTIRE YEAR OF ACCESS to Hybrid Fitness for the same price. Trust me, it’ll be well worth the time and price.